Low-resistance metal interconnects and spin-on low-k dielectric materials such as BCB have been widely used in GaAs IC manufacturing, writes Philip Garrou of Dow Chemical. Anyone keeping an eye on the silicon industry over the last several years knows that a major trend has been the move to copper and low-k dielectrics for interconnect fabrication (Lee). The Al/SiO2 interconnects used since the inception of the silicon IC no longer offer acceptable resistance-capacitance (RC) delays for today s faster chips. Moving into the sub-micron arena, the RC issues become so severe that chip performance is determined by the RC delay instead of the intrinsic gate delay. Changing from aluminum to copper reduces the metal resistance by approximately 40%, and changing from SiO2 to a low-k dielectric can reduce the capacitance by as much as 50%. In spite of this, both copper and low-k were seen as radical process changes which entailed increased cost and risk, and they were only accepted slowly and one at a time. The first IBM Cu/SiO2 process came to market in 1998 at the 0.25 µm node. Low-k dielectrics (whether spin-on organics or vapor-phase deposited inorganics) have been even slower to market, and are only now beginning to be seen in commercial products at the 0.13 µm node. Many GaAs device manufacturers have actually led the way in the use of both lower resistance metals and spin-on low-k dielectric processing. The vast majority of GaAs devices have traditionally been fabricated using lower resistance gold interconnects. Typical interconnect metal resistivities are 2.7 µΩ.cm for aluminum, 1.7 µΩ.cm for copper and 2.3 µΩ.cm for gold. Dielectrics can be used in several unique ways during the fabrication of GaAs devices. The dielectric can serve as an inner-, or inter-layer dielectric material, insulating interconnect lines and providing a planar surface for the fabrication of the next layer of interconnect. It can be used to encapsulate air bridges, making them better able to withstand the rigors of plastic packaging. It can also be used in MMIC devices to fabricate multilayer matching circuits and passives on GaAs devices, or on silicon substrates to which active GaAs- or InP-based devices can be attached. It is also being used in optoelectronic device fabrication as a passivation and isolation layer in the manufacture of mesa diodes. One such dielectric in commercial use is benzocyclobutene, or BCB, which was commercialized by Dow Chemical under the trade name Cyclotene in 1992-1994 as a dry-etchable (3000 series) and photosensitive (4000 series) spin-on dielectric. BCB is thermally polymerized at above 180 °C, and there are no catalysts or byproducts evolved when it is cured. Curing can be done rapidly, e.g. around 2 hours at 205 °C or less than 30 minutes at 260 °C. The glass transition temperature of BCB films is greater than 350 °C, the water absorption at 85% humidity is below 0.14%, and the material shrinks by less than 5% when cured. Some of the electrical and mechanical properties of BCB are listed in the table. 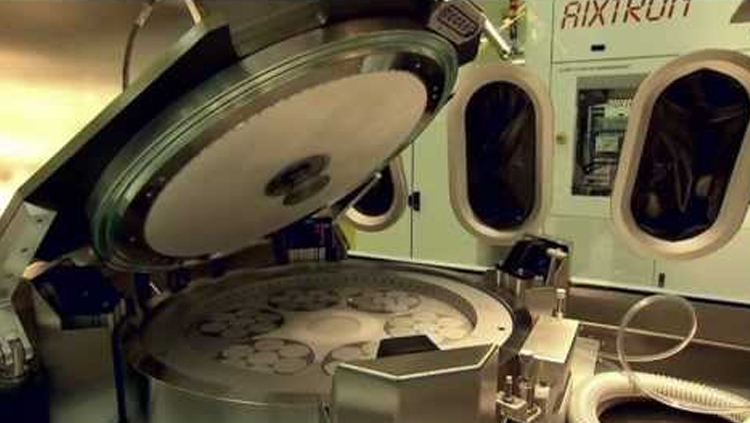 While silicon technologies with multilevel interconnects require chemical-mechanical polishing (CMP) to achieve planarized surfaces upon which to conduct sub-micron lithography, BCB is inherently planarizing (see figure 1). Structures fabricated with BCB do not require the use of CMP. For instance, isolated 20 µm wide x 4 µm thick aluminum lines have greater than 90% planarization when covered with 4 µm of BCB. The first documented use of BCB in compound semiconductor fabrication occurred in 1993 at what was then Bell Northern Research (now Nortel). AlGaAs HBTs with cut-off frequencies of 60 GHz were fabricated, and the process was later modified to allow the fabrication of GaInP HBTs (Surridge and Lester). Products incorporating HBT-based circuits, including OC-192 (10 Gbit/s) fiber-optic components, have accumulated many thousands of years in the field (corresponding to billions of transistor hours) without any failures. TriQuint first detailed the use of BCB in 1994 as an interlayer dielectric for GaAs in its QLSI-2 process (Finchem et al.). Figure 2 shows an SEM photomicrograph of circuitry fabricated with this production process. All four levels of interconnect are visible (the dielectric has been removed to facilitate imaging of the underlying circuitry). TriQuint reports that nearly 100% planarization of the underlying topography is achieved, and also notes that the low shrinkage of BCB is important to technologies such as GaAs that are sensitive to process-induced stress. Several successive generations of this technology have been in production since 1994. More recently TriQuint has developed multiple process technologies using a multilayer gold/BCB technology. The InGaP HBT process, shown in cross-section in figure 3, has three levels of interconnect metal. TriQuint has also developed a 0.5 µm TQPHT technology (a PHEMT process), and a TQRCL technology, a pure passives process using thin-film NiCr resistors, MIM capacitors and high-Q inductors. In all of these processes, the interconnect layers are encapsulated in BCB.